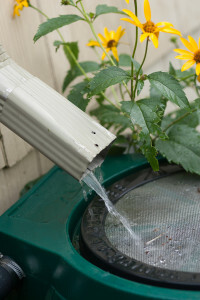 Adding a rain barrel to your seamless gutters from ABC Seamless of Albuquerque is an easy way to help you keep your lawn healthy at your home in Tijeras, New Mexico, or a surrounding area. We have been in business since 1989 and our team specializes in offering outstanding seamless steel products. The rain barrels that we offer along with our rain gutters is especially useful during the long periods of dryness experienced throughout the area. And, because the barrels collect water that would have otherwise drained out into your yard, they can be helpful for preventing landscape erosion. Furthermore, it is essential to have an efficient gutter system installed on your home to be able to get the most out of your rain barrel. In fact, seamless steel gutters are your best protection against the rare moments of heavy rain experienced in the area. That is because they are not susceptible to cracks or leaks that are normally experienced in pre-cut gutters. And, the gutters used by ABC Seamless of Albuquerque are 30 percent wider than traditional gutters to help rain flow more efficiently throughout your gutters. For more information about seamless gutters or rain barrel options for your home in Tijeras, NM, or another surrounding community, contact ABC Seamless of Albuquerque today.